The main purpose of stretching exercises is to reduce the muscle tension, keep the muscle flexibility, prevent pain and injury, and make you feel more relaxed. However, you keep a good posture at work, if your job consists in spend an average of six to eight hours sitting in front of the computer, you may develop muscle tension or pain. Neck, shoulders and back are common pals of a sedentary job. As a preventive action do some stretching exercises. Here you have 12 different stretching exercises that you can do at the office, they are divided into: upper arm and shoulder stretch, chest stretch, neck stretch, back stretch and legs stretch. Place one hand under your elbow. Lift your elbow and stretch it across your chest. Keep your body upright. Hold the stretch for 8 to 10 seconds. Relax and repeat with your other arm. Gently pull one elbow to the opposite side overhead. Place your other hand on the bent elbow to help stretch your upper arm. Hold it for 8 to 10 seconds. Relax and repeat the stretch with the other arm. Sit on your chair; lift both shoulders at once up toward the ears. Hold for 8 to 10 seconds and roll them back as you relax down. Repeat it for 4 to 6 reps.
Place your hands behind your head. Squeeze your shoulder blades together, bringing your elbows back as far as possible. Hold the stretch for 15 to 30 seconds. Relax and repeat the stretch. Face straight ahead. Lower your chin to your chest and you will feel tension in the back of your neck. Hold the stretch for 15 to 30 seconds. Relax and repeat the stretch. Face straight ahead. Turn your head to one side while keeping your shoulder straight, so you will feel tension in the side of your neck and shoulder. Hold the stretch for 15 to 30 seconds. Relax and return to the starting position. Turn your head to the other side and repeat the stretch. Face straight ahead. Tilt your head so that you are moving your ear toward your shoulder, you will feel tension in the side of your neck. Do not bring your shoulder up to your ear. Hold the stretch for 15 to 30 seconds. Relax and return to the starting position. Tilt your head to the other side and repeat the stretch. Lower back: Sit on your chair. Hug one knee at a time, pulling it toward your chest. Hold the stretch for 15 to 30 seconds. Relax and return to the starting position. Repeat the stretch with the other leg. 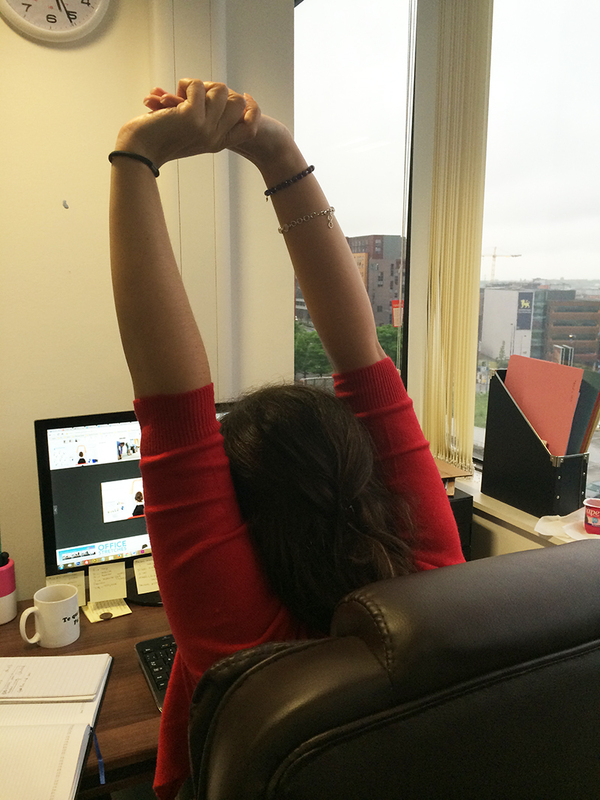 Upper back stretch: Sit on your chair, claps your hands in front of you and lower your head in line with your arms. Round the back, reaching away as you relax the head. Hold the stretch for 15 to 30 seconds. Spinal twist: Sit on your chair, contract the abs and gently twist the torso towards the right, using your hands to help deepen the stretch and keeping the back straight. Hold for 15 to 30 seconds and repeat on the other side. Thigh stretch: Stand up straight, grab one of your ankles and bring it up toward your buttock, you can place one hand on a chair or desk for stability. Hold the stretch for 15 to 30 seconds. Relax and return to the starting position. Repeat the stretch with your other leg. Hip stretch: Sit on your chair, cross the right ankle over the left knee. Gently lean forward while keeping the back straight and reaching out with the torso until you feel a stretch in the right glute and hip. Hold for 15 to 30 seconds and repeat on the other side. If you have enjoyed this post, please do share it with your friends and networks.